But obviously that’s a pretty darn bold claim & I’m sure you’ll sceptical about it which is probably why you’ve landed here at this review… So what’s the truth? Does it really work like it’s creator Jack Heaton promises? Or is the AD Formula scam that’s set out solely to part you with your cash? What Exactly Is The AD Formula System? Okay so the AD Formula system, which has allegedly been put together by a guy named Jack Heaton is a new money-making platform that’s just recently launched with the bold promise of being able to supposedly help it’s members earn as much as $3,000 per day online. Jack, the guy who’s apparently behind the whole thing states on the AD Formula website that it’s a “premium online ad revenue system that provides members with passive income“… And then he goes on to state that he’s trialling it internationally & is looking for beta testers who want to make profits of $3,000 per day. Well according to the website it’s as simple as 3 steps – you just need to sign up, activate your account & watch your profits grow. You’re told that it couldn’t be simpler & that you can literally begin making money within just 10 minutes of getting started. But it all sounds WAY too be to be true right? And you know what they say about stuff that sounds too good to be true… It usually is! So what’s the deal? Is the AD Formula a scam or can you really make money with it as easily as Jack Heaton claims you can? How Does The AD Formula System Work? So after doing a bit of digging into the AD Formula system I was able to find out that the whole thing actually revolves around something called ad flipping, which is a known scam that I’ve previously exposed on this blog. So it kinda sounds like a win-win, not only do you get the chance to earn passive income, but you also get the chance to make money by reselling the ads again at a later date too… How can you lose? Well sadly the truth is the whole thing is nothing but a SCAM. In reality the whole ad flipping concept doesn’t really exist – you can’t invest in online advertising & earn profits like the guys behind the AD Formula system claim you can, it’s just a hyped-up ploy to trick you into parting with your cash so that they can earn some money at your expense. You see after signing up to the system (which if you haven’t done so already I absolutely don’t recommend you do) you’ll actually be redirected through to another scam website named BannerBit – and this is where the transactions take place. 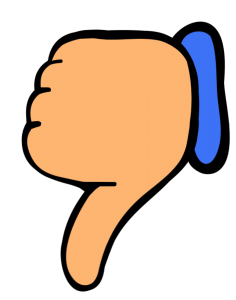 The AD Formula system itself is basically just a “front” for BannerBit… And the reason they use these “fronts” is because the BannerBit website itself has received many, many negative reviews… So instead they launch various systems under different names so that when you look for reviews you don’t see all of the bad stuff that’s been written. In fact if you read my review of Daily Banner Profits you’ll see that the website is almost identical to that of this new AD Formula system. They’ve basically just changed the name & “re-jigged” it around a bit to continue trying to part people with their hard earned cash. Well essentially what the guys behind this whole thing have done is create a very realistic looking “ad flipping marketplace”… And to a newcomer to making money online it can seem like a legitimate way to make money. So you’ll sign up, then after doing that you’ll be pressured into depositing some money. The amount you deposit will have to be at least $250, but upon signing up you can expect to receive several phone calls from “the team” at BannerBit who’ll try to convince you to deposit literally anything & everything you can afford. They’ll promise that you’ve come across a great opportunity & that you’re going to become rich… But that is just not the truth at all. From there after depositing you’ll then be taken to your “ad dashboard” where you can invest in various advertisements. You’re told that the ads are being displayed around the web & that you’ll get a cut of the revenue that the ads are generating… Plus like I mentioned earlier in this review you’re also told that you can later resell them for profit too. However the reality here is that the whole thing is more or less a video game. Sure, they’ll let you invest – but the adverts aren’t really being displayed anywhere like they claim… Instead they just “fake” the profits to make it seem like you’re generating good money. Sadly though this is where the scam escalates, as they’ve tricked you into thinking that you’re making money – but they claim you have to make a certain amount of investments before you can withdraw… And this is how they trick you into investing more money into to the scam. From there the same cycle literally continues & continues until you finally realize that you’ve been taken for a ride & that the whole thing is actually fake. At that point you will be left to realize that you have been tricked, and that you have been scammed several times out of your hard earned cash… So clearly the best option is to simply avoid it in the first place. So for that reason I’ve decided to bring to your attention some of the red-flags on the AD Formula website which prove it is indeed a scam & that you should definitely avoid it unless you want to lose money. 2. Featured In The News? Nope! A quick Google search though & a search of each of the individual sites proves that those claims are totally false. The AD Formula system has never been featured on any of those sites listed. 3. Sarah Made $588? From Acting Maybe! On the website of the AD Formula system you’re shown several testimonials of so-called members who claim that they’ve been making a whole bunch of cash from the system… But they’re all paid actors! 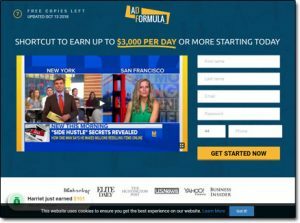 My Verdict – Is The AD Formula Scam? Yup, in my opinion the AD Formula system is 100% a scam & you can probably see that for yourself now too after reading this review. The whole thing is just set out to part you with your cash. In short, after signing up you’ll be redirected through to the Banner Bit website & it’s there you’ll be pushed into depositing as much money as you can to “profit from ad flipping”… But the whole concept is a phony. Instead you’ll just find out after making the deposits that you’ve been conned and that the only person who’s really making money from the whole thing is the scammer that’s behind it all. So for those reasons it’s safe to say that there is NO way I will be recommending the AD Formula system to you, but don’t worry, all is not lost because there are indeed still legitimate ways that you can make money online. I mean you have to understand though that making money online properly takes work (you’re just going to get rich overnight), but if you’re willing to put in the work then you should check out this which has enabled to make an income over $10k per month. It’s my top recommendation for anyone looking to get started. The Millionaires Maker Review – Will It Really Make You A Millionaire? Group Deal Tools Review – Scam or Legit Way To Make Money? The Truth!